I've been crafting and creating again, this time making a dashboard for my personal size. I toyed with the idea of doing something different, but as it's supposed to work alongside my A5 I decided that the dashboard would be very similar. It's not exactly the same as my A5, but from the same paper stock. The only down side to this was that some of the pictures were too big to use as the personal is smaller. The paper was from Amazon and is Disney themed scrapbook paper. 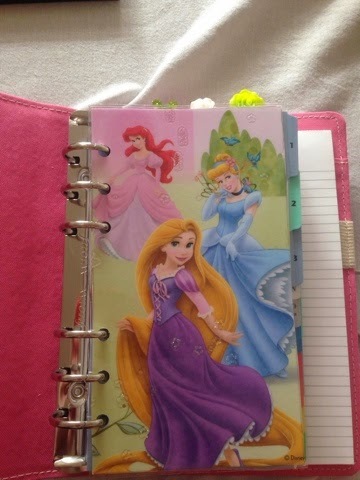 There's a huge selection available but I opted for the princess papers. Hole punching was an experience too. I bought a rapesco personal size hole punch a while back, believing it to be A5. Not only was it a bit stiff, though I attributed this to the laminated paper, but it was trickier than I expected to line up. I'll need a bit more practice before I do dividers to match the dashboard. All in all though, I'm happy with the way it has turned out. It looks so sweet in the front of my planner. I have a rapesco and I never struggle with it. Some people always seem to. Maybe there are different suppliers or something? I think it was me to be honest, I need a little practice lining paper up in it. I've tried it since with paper and it punched no problem.